Janet is going to be on a radio show December 4, 2013. 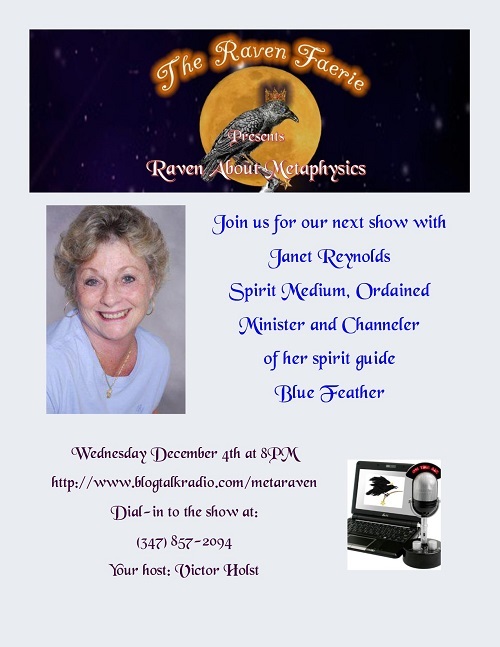 It’s called Raven About Metaphysics, hosted by Victor Holst and will be aired at 8:00pm. The guest for the March 19, 2013, edition of Insight is Dr. Jenny Mejia, DC of Ribley Chiropractic. The topic will be Spinal Health. Janet’s guest on March 12th’s Insight is Patricia McGivern. The subject will be Regression. Janet’s guest on the March 5, 2013, show of Insight will be MaryLou Houllis, and the topic with be the Mayan calendar, among other things. On this edition of Insight Janet has a special guest – her daughter. Together they covered quite a few subjects. Join Janet on Tuesday, February 12, 2013 as she discusses dreams and dream work. This week’s show will be on the subject of Health and Weight Loss. The guest will be Dorothy Roby. On the December 18, 2012 edition of Insight, Janet Reynolds will have Trish Golden on the show, and the topic will be Winging It. Join Janet and Blue Feather on her December 11, 2012 edition of Insight. Her special guest will be Patricia V. Scott,PhD, CHt. The topic will be Hypnosis and Relaxation. Patricia (“Patti”) Scott is a Certified Medical Hypnotherapist (since 1992), Certified Master Trainer for the International Association of Counselors & Therapists, and Life Fellow with the International Medical & Dental Hypnotherapy Association.